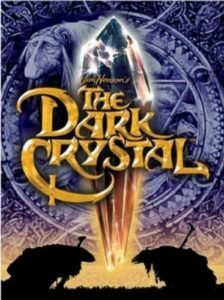 018 – The Dark Crystal | All Eighties Movies. All The Time! This week we travel to another world at the time of the Great Conjunction and see if Jen can fulfill the prophecy that a Gelfling will heal the world. That’s right, Gidgit and Angry are watching the 1982 work of art that is The Dark Crystal! This entry was posted in Podcasts and tagged dark crystal, fantasy, kids. Bookmark the permalink. I love this film so much. Thank you for the pod cast. I listened to it on my way to work and reminded me I need to show my kids. I agree children should not be in a ‘bubble’. I grew up watching my parents movies as well. So many memories of this fantastic movie. I was a huge The Muppet Show fan. Thanks Angry and Gidget. Great podcast. Listened to a few but have to say you both did the best. Well done. My kids LOVE this movie as I do. Lots of podcasts out there for this but truly enjoyed yours. Just had to tell you. My 8 yr old listens to your podcast of this often. No swearing or offensive nature so I have no problem with her listening to this. Thank you. I kind of want your podcast to be more ‘a little bit of trivia’ than explaining the movie. More trivia please. Will listen to more. I felt I needed ot leave a comment as Ive only just discovered your wonderful podcast and thrilled to see its clean to play in the car with my kids. We loved your Dark Crystal pod cast and tomorrow they want to listen to Laybrinth. We are all very excited to catch up on many many pod casts. Eighties movies rule.